Additional research provided by Stephen C. Compton and John C. Inscoe. Related: Backcountry; Cape Fear; Fall Line; Great Dismal Swamp; Mount Mitchell; Outer Banks; Piedmont Urban Crescent; Geography; Our State Geography in a Snap! Running roughly northeast to southwest, North Carolina's western Mountain region rises abruptly from the Piedmont plateau along the Blue Ridge escarpment on the east, ending with the Unaka Range on the western boundary, then taking a more gradual decline to the west into Tennessee. As the ancestral home of the Cherokee Indians, the Mountain region was the primary territory for the native people who first settled the rich but rugged mountain terrain. Today, the Eastern Band of the Cherokees live in the Qualla Boundary, a reservation established following the forced removal of the Cherokee to Oklahoma Indian Territory in 1838. At 63,000 acres, it is the largest reservation east of the Mississippi River. In 1540 Hernando De Soto became the first European to visit North Carolina's Mountain region. In the eighteenth century, Daniel Boone traveled the area, hunting, trapping, and gathering ginseng for sale in northern markets. William Bartram, noted eighteenth-century botanist, explored the region as well. European settlement of the Mountain region began in earnest in the eighteenth century with the arrival of Scotch-Irish, English, and German settlers from Virginia and Piedmont North Carolina. Geologically, eons of uplifting, folding, and erosion of the earth's surface have shaped the ancient mountains of western North Carolina to their present form. Prominent cross ranges extend between the Blue Ridge and Unaka Mountains, including the Pisgah, Balsam, and Black Mountains. The Pisgah Mountains run to the Tennessee line and include Mount Pisgah at 5,750 feet. The Balsams have an average elevation of 5,500 feet and include 15 summits above 6,000 feet. The Unaka Range also includes the Great Smoky Mountains. 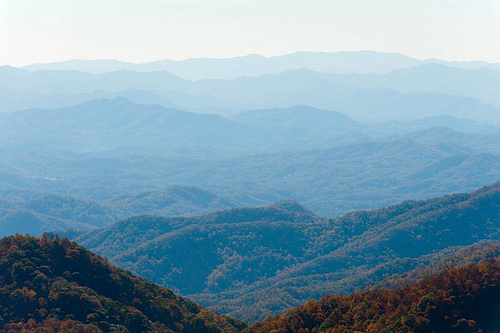 Straddling the state line between North Carolina and Tennessee, the Smokies encompass more than 800 square miles of heavily wooded wilderness. The Great Smoky Mountains National Park, with 9 million visitors annually, is the most visited park in the national park system. The highest peak in the Smoky Mountains, Clingman's Dome, is 6,642 feet. Some Mountain region rivers-among them the Hiwassee, the Little Tennessee, the French Broad, the Nolichucky, the Pigeon, the Elk, and the Watauga-rise west of the Eastern Continental Divide and ultimately drain into the Gulf of Mexico. The New River (not to be confused with the New River of eastern North Carolina) is regarded as the second-oldest river in the world, after the Nile in Egypt. The Black Mountains, although the smallest mountain range in North Carolina, include the state's highest peaks. Extending a mere 15 miles in length in Yancey County, the Black Mountains boast 6 peaks that are among the 10 highest in the eastern United States, including Mount Mitchell, the highest point east of the Mississippi River at 6,684 feet. The name of the range comes from the thick, dark forests of balsam and fir trees that cover it. The great variety of flora and fauna in the Black Mountains long inspired scientific interest in the region. Naturalist William Bartram, French botanists André Michaux and his son François, and Englishman John Fraser explored the area in the late eighteenth century. The elder Michaux collected over 2,500 species of plant life during a trip to the area in 1789. Their writings inspired further botanical exploration and collection throughout the antebellum period, most notably by eastern North Carolina naturalist Moses Ashley Curtis. The range became a popular area of interest for tourists and scientists throughout the rest of the nineteenth century. Concern over the conservation of its forest resources resulted in the creation of Mount Mitchell State Park in 1915, North Carolina and the South's first state park. Mount Mitchell's peak was made more accessible to tourists at that time, when a logging railroad was opened to passengers; by the end of the 1910s it had become one of eastern America's most popular tourist attractions. A motor road completed in 1922 opened the peak to automobile traffic for the first time. The completion of the Blue Ridge Parkway through the Black Mountains in 1950 dramatically increased the number of tourists to the Mountain region. A campaign in the 1970s by Asheville writer and environmentalist Michael Frome and Congressman Roy Taylor to create a national park in the Black Mountains met considerable resistance from Yancey County residents and was abandoned in 1979. In addition to its vast forest assets, North Carolina's Mountain region is a major source of mineral resources. The Spruce Pine mining district is renowned around the world for its mineral production; today it is a source for ultrapure quartz used in computer applications. Forestry, mining, agriculture, and tourism provide income to many Mountain residents. Growing cities such as Asheville, Boone, and Hendersonville offer increasingly diverse opportunities for work, education, and cultural enrichment. David Cecelski, A Historian's Coast: Adventures into the Tidewater Past (2000). Chris Florance, Up from Mount Misery: The Blossoming of North Carolina's Sandhills (1990). Linda Flowers, Throwed Away: Failures of Progress in Eastern North Carolina (1990). Thomas W. Hanchett, Sorting out the New South City: Race, Class, and Urban Development in Charlotte, 1875-1975 (1998). Douglas M. Orr Jr. and Alfred W. Stuart, eds., The North Carolina Atlas: Portrait for a New Century (2000). Bland Simpson, Into the Sound Country: A Carolinian's Coastal Plain (1997). Ina W. Van Noppen and John J. Van Noppen, Western North Carolina since the Civil War (1973). "Andre Michaux." NC Highway Historical Marker N-22, NC Office of Archives & History: http://www.ncmarkers.com/Markers.aspx?sp=Markers&k=Markers&sv=N-22. Poggi, Jacqueline. "Blue Ridge Parkway." October 15, 2011. Available from: Flickr Commons, http://www.flickr.com/photos/jacqueline_poggi/6730137539/ (accessed December 5, 2012). thanks so much for this site, Doesn't get enough credit! Really informative.